Often we are asked here on Bella Petite Magazine for outfit ideas that are flattering on petite women’s figures. Being a 5’2″ (98lb) petite woman with an hourglass figure (34D-22-34) and a short torso, I have spent a lifetime learning how to be fashionably petite! I strive to make the most of my inches by selecting figure-flattering styles, which create slim lines to elongate my frame. My first very simple rule to follow is to know your figure type. Once you know your figure type, you can more easily identify what is going to look the best on you. Not every style or trend is meant for you to follow. Personally, I appreciate the classics and with simple lines you really can’t go wrong. That is why I was super excited to see the classic elegance of the 20’s and 30’s styles revived offering a fresher look this season. The following are my top five favorite fashion suggestions that look great on most every petite woman’s figure type. I will do my best not to be totally conservative, boring and predictable, with these suggestions because fashion should be fun for you! Drop waists are great for shorter torsos and many petite women’s figures. Whether you are trying to look taller, hide a few extra pounds, shorter elongate torsos or have longer legs this dress can do it for you! This look detracts from your waist giving you a long line of sight. For a petite it is crucial that it hits mid thigh, and the drop waist hem sits right above your hips (Victoria Beckham is spot on). This is a fashionably fun look and a bit risky, so I’d make sure to pick a solid color. Plus, you can pair it with a jacket and small belt. This may be my most predictable suggestion, but it is a practical solution for a petite woman’s figure. You just can’t go wrong! Whether for business or play you will look great! Clearly selecting one color from head to toe will make you appear longer and leaner no matter the color choice. In my humble opinion hemming is a fact of life for most petite women 5’5″ and under. Unless you opt for jeans designed for petite women. A low rise jean is great for a short torso. The skinny jean is great for the petite fit, or thin, petite woman. For the plus size petite woman (size 10 or greater), check into straight cuts with slim fit technology, Lane Bryant has you covered, see photo, shown on the right! The best rule with finding a great fitting jean is the fit consider the following: Size, Inseam, Style, Rise, Fabric, and Technology to best suit your figure issues. LIKE IT, OR NOT? Tell us below. Tell us below. Join Bella Petite today and support the petite woman’s fashion and model movement. 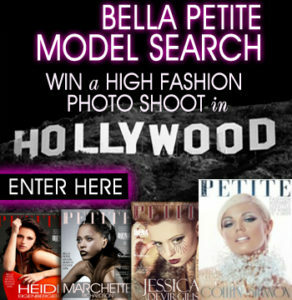 Bella Petite Magazine features fashion, entertainment and lifestyle for women 5’5″ tall & under. “Petite is fit and full figured. Free to join our fashion initiative us! BELLA PETITE MAGAZINE Enter the Bella Petite Model Search. WIN an all expense paid photo shoot, fashionable spreads, promotions and tearsheets for your book! Enter the ONLY magazine model search in the world for petite women 5’5″ tall and under. Thank you for sharing this post. I agree, being under 5ft, us, petite women learn how to be creative with all of our clothing options. Go petites! I’m 4ft 8 tall and I’m 33 years old. I would like to see more petite women in your pictures as models. Everything looks amazing in models or in women more than 6fts. I would like to learn more about fashion in petite women and to see examples of what the article says with women like us. Thanks! Hello Sofia, all of the women featured in this article are petite celebrities in order to show you how the clothing styles will look on you. Our model search is for petite models and they are the models featured in our editorials, so we are showing you how petite women look in properly scaled clothing for us. Thanks for your commentary. We hope you will keep on being a loyal subscriber. Have a good day! Is selena gonez 5ft 4? How bout lily collins? Great post. Thank you for sharing this. You are giving us petite women an inspiration to embrace what we have. Thank you. All those tips may hold true for petite women in general, but most of them do not apply for curvy women. We have the unique challenge of having breasts, hips and thighs on a short figure, so it is tough to look slim and not broad (damn wide hips). The key is to emphasize the waist. Always. I’m 5 0 and a text book hourglass figure and I learnt this the hard way- most fashionable clothes are not made for me. No empire waists- they hide my natural 23 inch waist. So does drop waists.Low rise jeans make the hips wider. I think ur advice is great- for more straight figured women. Fairy, I totally disagree with what you said to Bella Petite. These tips are very helpful for me. I am 5’2″ with hourglass figure type just like the editor of this magazine she is the beautiful girl in the purple dress and her figure is hourglass shaped as you can see. I would say she has the textbook hourglass figure and she looks amazing 🙂 Look at Mila Kunis and Halle Berry they too have hourglass figures, so this advice is spot on in my opinion! You may have hourglass figure, but your weight may be the real reason as to why these suggestions don’t work for you as you say. That advice is just what I’ve been looking for Bella Petite you are a great read. I highly respect the editor Ann Lauren she is an innovator who inspires women to be great. Thanks! Much love to bellapetite you are the best! I’m sure there will be great info further down the article. But for now- why do I need to know you weigh 98 lbs? The measurements are enough to give us an idea of your build. Some of us have had eating disorders. We have learned to accept that we are fine at a larger size, or less “perfect” shape; we wisen up enough to know life is much richer than numbers on scales or tapes. I’ve conquered eating disorder. Not only do I accept myself now, I am accepting of all other women too. Life has taught me that whatever our genetic lot or situation, we are beautiful.